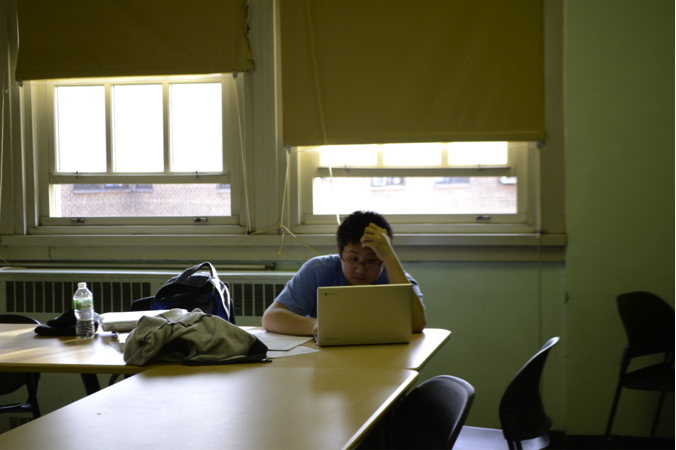 A student working in a designated Silent Space. Photo credit to Emma Bally, ’17. Lately, have you been looking around for the time in class and actually found a clock, or better yet, a clock with the accurate time? Have you noticed more paper towels in the bathroom? More hand sanitizer? Thanks to the building/facilities committee of the Student Union, some basic facility-related complaints have been addressed throughout the school. This committee is the link between students and the higher powers of the school, those that are in charge of fixing things such as broken bathroom stall locks and broken clocks. During a recent meeting, the committee went from class to class to mark how many rooms had functioning clocks, broken clocks, or no clocks at all. The majority of the rooms had broken clocks, as well as piles of clocks without batteries thrown on top of each other. To remedy this, the committee, chaired by Rebecca Weinberg, Y1, shared the information with Dr. Lerner and the custodians. By the students telling them directly what we are lacking, the matters are dealt with accordingly. Although there is gradual improvement, some rooms still do not have the time, which can be detrimental to students during timed situations, such as tests. “Clocks allow us to have a sense of time in class so we can plan ahead,” expressed Samantha Scully, a 10th grader. A faster and more dramatic repair involved the locks in the second floor girl’s bathroom. Since the beginning of the school year, two of the stalls had no locks, causing the doors to frequently fly open. This caused overcrowding in the bathrooms while lines formed for the one functioning stall. This crowding has been an issue since the beginning of the year as well because the changing rooms have been under construction. The changing room should be back in action by February. However, locks were recently added to the stalls. “I don’t have to hold the door with my feet anymore,” Cadyn Morgan-McGregor, 10th grade, said excitedly. These little things go a long way for BHSEC students. Other issues that the committee is trying to focus on are the flooding in the bathrooms, as well as the supply and quality of paper towels and soap. Another addition for the betterment of students came in the form of the new silent spaces, set up by the committee with the help of Ms. Walk and Dr. Freund. As we reach the halfway point of the semester, the workload increases as time goes on. The silent rooms provide a quiet area for study during every period of the day. When there are no empty rooms and everywhere else is too loud, the rooms are there in the library, 503, or 504. However, while walking by the silent rooms, they appear to be empty. “I didn’t expect the rooms to be used as much as the library, but the important part is that they’re there when people need them,” said Ms. Walk. If you see an issue around the school, email SUfacilitiescommittee@gmail.com with the problem and location. It is also important to keep in mind that the requests must be reasonable; unfortunately, BHSEC does not have the resources to make larger bathrooms or add new rooms. We have to deal with the space we have and utilize it the best we can. If you would like to provide input or ideas, Student Union general meetings are open to all students on the first Thursday of every month. Additionally, if you would like to join a committee such as facilities to improve our school, you do not need to be an elected member of the Student Union to be on a committee. Committees are formed on an as-needed basis, so if you have a problem, do not hesitate to bring it up with your SU grade representatives.